Dale moved to Cleveland to be with her family! YES, family matters! Dale is the new Program Director for Youth and Social Services at the Cleveland Foundation.She will be working to impact social & economic issues similar to those that are prevalent in Newark. Is she still going to be involved in Newark? Yes, she will remain on a few boards and she is only one phone call away.Don't be shy you can call or email her at any time.She is also on Facebook. Maybe. Dale plans to spend time doing some reflective writing. However, better than writing a book, she recently co-facilitated a national conversation about another book:The Prize.Her workshop was called "How Not to Read the Prize. "Pictured above are the 3 panelists: Robert Clark, Mayor Ras Baraka, and Superintendent Christopher Cerf. Read more below! 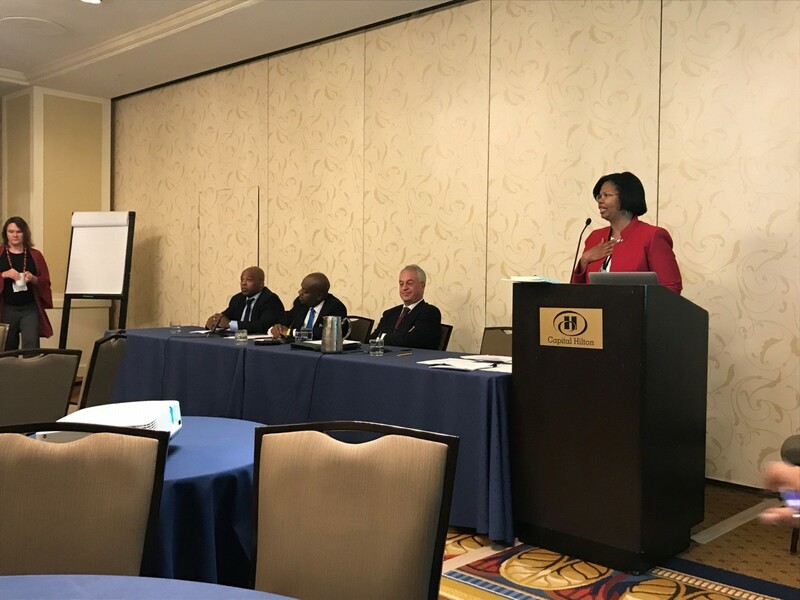 Dale's last hurrah for Newark and the Victoria Foundation occurred on October 17, 2017 in Washington D.C., where a national grantmaking conference was underway. The Grantmakers for Education Conference convened in the nation's capital to discuss education and philanthropy. From the moment all arrived, there was a buzz in the air for a panel entitled "How Not to Read the Prize: Lessons from National-Local Initiatives." Our very own Dale Anglin organized this powerful panel with Mayor Ras Baraka, Superintendent Chris Cerf, and Robert Clark of YouthBuild-Newark and the Opportunity Youth Network. The panel's goal was primarily to re-frame the narrative of Zuckerberg's 100-million-dollar donation to the Newark Public Schools, in order to assure national funders that philanthropic activity in Newark is still a good bet. Dale graciously moderated the powerhouse panel, pushing the panelists to name setbacks while also celebrating the good. Panelists discussed all the collaborative work happening in the City, much of which Dale was instrumental in creating. The Newark contingent highlighted growing student enrollment at Newark Public Schools, an increased graduation rate of 77%, and the return of local control. In addition, Newark's charter school success was celebrated, given its ranking as the second highest performing charter sector in the country. Dale's nuanced approach left a standing-room only audience impressed with Newark and its leadership. The panel, much like her time in Newark, was not about her, but about our beloved city. She masterfully conveyed a belief in Newark grounded in its possibility and its people. Newark could not be more proud of its team, but especially of Victoria's very own Dale Robinson Anglin.